Chuck Noll won four Super Bowls and presided over one of the greatest football dynasties in history, the Pittsburgh Steelers of the '70s. Later inducted into the Pro Football Hall of Fame, his achievements as a competitor and a coach are the stuff of legend. But Noll always remained an intensely private and introspective man, never revealing much of himself as a person or as a coach, not even to the players and fans who revered him. 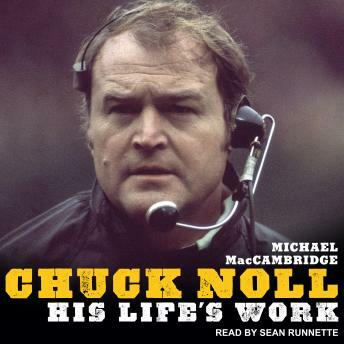 Chuck Noll did not need a dramatic public profile to be the catalyst for one of the greatest transformations in sports history. In the nearly four decades before he was hired, the Pittsburgh Steelers were the least successful team in professional football, never winning so much as a division title. After Noll's arrival, his quiet but steely leadership quickly remolded the team into the most accomplished in the history of professional football. And what he built endured well beyond his time with the Steelers-who have remained one of America's great NFL teams, accumulating a total of six Super Bowls, eight AFC championships, and dozens of division titles and playoff berths.